The Seagull Performer CW Mini-Jumbo Flame Maple QI, as with all Performer models, features beautiful Flame Maple back & sides, a Select Pressure Tested solid spruce top, Custom Polished High-Gloss finish, and onboard electronics with built-in tuner. 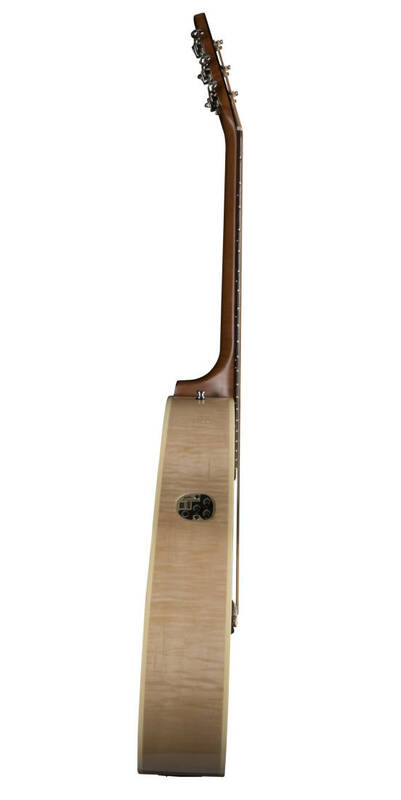 The Mini-Jumbo provides an excellent full-range of tone including a lively mid-range due to the combination of a larger lower bout, a more narrow waist and slightly thinner body depth. The Quantum 1 electronics on the Seagull Performer series guitars include a built-in tuner and are a standard feature on these models. This combined with a cutaway and Seagull embroidered gig-bag makes for a great package for the gigging musician. This guitar has a nice bright tone that can cut through the noise, a neck that is smooth, slim and comfortable to play, incredibly well built, light weight, resonant, comfortable to hold, and absolutely beautiful, well worth the price. I've also owned other Seagulls over the years including an S6, Artist series, SWS series, and Concert Hall. It's just another great Godin guitar. Another amazing Canadian-made Godin. Spent an hour and a half in the Burlington store playing Martin, Taylor, and Seagull. Not only is this guitar half the price, but it is just as good as a Taylor or Martin. Incredible attention to detail (like on all Godin guitars). Kind of cool too that they keep the inspection tag on the guitar when you buy it, showing people's initials having signed off inspecting it. Also, quite nice that one does not have to make any adjustments after purchasing. This is my second Godin (I bought a Session earlier this year). Seagull can claim two of the finest acoustic guitars on the market; this Mini Jumbo & the Coastline Momentum. Workmanship, and a high gloss finish that is second to none! And both a pleasure to play. I also own Gibson & Martin, and our Canadian Seagulls go with us to the Jams more frequently then their higher priced competitors. I feel good playing it, and as a proud Canadian, I'm delighted with it's fine Canadian workmanship. Sound-wise, it is NOT my Gibson J-200. Tested taylor guitars that are even more expensive than this one but still keep going back to this guitar.produces bright sound and solid quality. I actually bought two guitar in a day just to compare, the other one is yamaha fg700s returned it right away. I consider myself a beginner at guitar. This guitar is very well made & came set up very well. I have no regrets with this purchase as it is truly a pleasure to play. Canadian made & sounds great!